Yes, need to connect and authorise to core via SSH first - via terminal or something. Add a tunnel to a local port and then change the settings in the touch orbiter to your local IP address and whatever port you have setup. I think I used connectbot when I did the test but I believe there is dedicated SSH tunning apps that might simplify the process if you were doing it often - and I think they can run by default as a proxy if you have a rooted device. I was using the same technique to access lmce admin and mythweb from my phone or laptop on the bus on the way home. That's very interesting, thank you. I have always accessed my core using SSL/HTTPS - what is your opinion on this vs your SSH tunnelling method? I have never been able to use your touch orbiter externally via SSL before; I assume it's not as simple as just putting in "https://<ExternalIP>" for the "LMCE Server" option. Just wanted to show off darrenmason's touch orbiter on my new(ish) Advent Vega running Honeycomb 3.2. Feels nice and responsive having never had a tablet that cost more than 100 quid (although I managed to pick this one up for only £130), and will test some more once my system is back on its feet. The Yarvik looks exactly the same and almost same price. 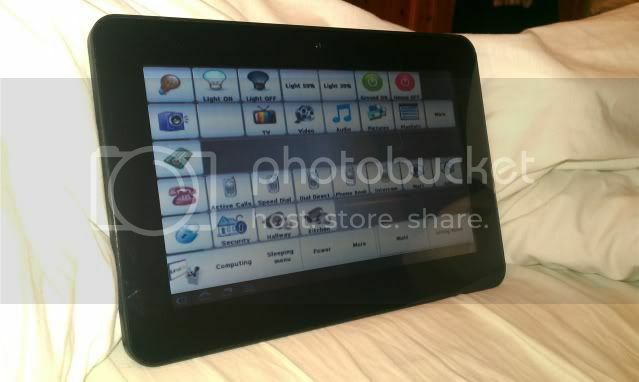 It also runs on the HP Touchpad (Running CyanogenMod). I don't think so. My tablet has a capacitive screen and nVidia Tegra graphics. Fellas, I'm using the android orbiter on a HTC EVO 3D which has a resolution of 540x960 on a 4.3" screen. Unfortunately, I have tried various orbiter sizes and none has filled the whole screen. I can make it get smaller with sizes such as the windows mobile selection. But getting it to fit the entire screen, rather than sit in the middle of the screen has been impossible. I used this orbiter on my HTC Hero when i had it, and it filled the screen fine, i assume because it was a smaller screen. Any size orbiter i select above 320x480 comes out the same size. any hints? Hey when I run this on my 10.04 system I get the screen but there are no options on the bottom. IE can't pick user, can't pick room. So I can't pick any media etc. Anybody experience this? Did I miss something when setting this up? Hello chaps, I have a resolution question - I've seen the various resolution discussions on this thread, but I'm not sure they address the issue I'm having. My tablet is 1024x600, but selecting this resolution in web admin makes it look pretty gash. The best resolution I've found so far is Nokia770 (800x480), but it still looks somewhat blocky. Why might the 1024x600 not be working properly? Is there a better way to choose the resolution? Or do I need to create a custom one? Ok, I added a new resolution and a new orbiter size successfully, but the same issue still exists. No matter what orbiter size I choose it does not fill the screen of my evo 3d. I can see changes in the orbiter, but it does not increase the size of the orbiter beyond a certain size. So it just sits in the middle of the screen. any suggestions? You may have to change some settings on your tablet. The top menubar takes up some of your display size, so your tablet may be shrinking orbiter to fit. IE if your screen size is 800x600 and the menu bar is 800x20 your true resolution is 800x580. There are settings to hide the menu bar. Not sure if this is your issue, just a suggestion. Kyfalcon, thanks for trying to help, but it actually has to do with the entries in the manifest when the app was developed. I found an app named "spare parts" in the android market. For those who may encounter the same issue, just download the app, find and deselect an option named "compatibility mode". Reboot. The spare parts app as well as the android orbiter should fill the screen after reboot. What I am actually using for and orbiter is my phone, a HTC EVO 3D. it has a larger screen than the usual cell phone. thanks. Is this anything to do with why I am not getting a sharp image on my 1024x600 tablet?